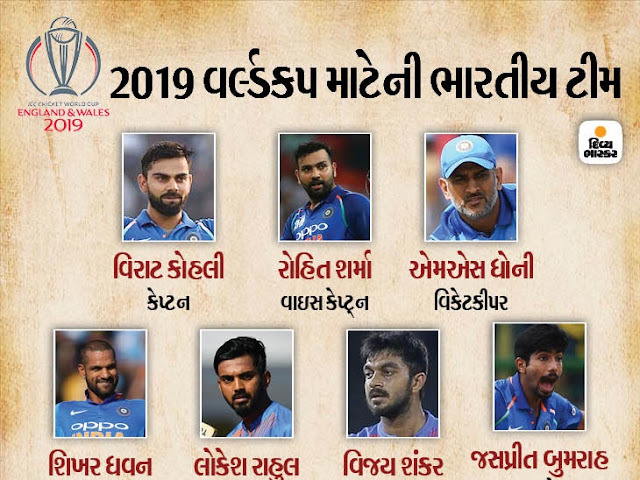 In the World Cup squad, three Gujaratis included Hardik Pandya, Ravindra Jadeja and Jasprit Bumrah. Sports Desk: The Indian team has been announced for the World Cup starting in England and Wales starting May 30. Virat Kohli is in the hands of MSC Prasad, the chief selector of the BCCI in Mumbai. In this team batsmen Rohit Sharma, Shikhar Dhawan, Lokesh Rahul, Virat Kohli, MS Dhoni and Dinesh Karthik have been picked. When all -rounder Kedar Jadhav, Ravindra Jadeja, Vijay Shankar and Hardik Pandya have been named. As a bowler, Jaspreet Bumrah, Mohammed Shami, Bhuvneshwar Kumar, Yuvraj Chahal and Kuldeep Yadav are included.